When Russ and I were living in Madison, Wisconsin, in the 70s, one of my birding friends, a retired Forest Service ecologist named Frank Freese, went on a couple of birding trips out in the Pacific Ocean off Monterey Bay with a woman named Debi Shearwater. Frank was thrilled with the breadth and depth of her knowledge and her competence as a guide—he said no one in his experience was so quick at spotting distant birds, accurately identifying them, and making sure other birders on the boat got a chance to see them before they disappeared. At that point Russ was working on his Ph.D. and I was earning low wages as a Catholic school teacher, so no way could I afford a trip so far afield, but ever since Frank planted the idea in my head, I’ve wanted to get out on one of those Shearwater Adventures. I met Debi in Duluth during our great owl invasion in the winter of 2005, but otherwise have admired her only from afar. What with doing my Conservation Big Year, I knew I’d never be able to reach 600 species without getting at least some of the huge assortment of oceanic birds that are an essential part of North America’s avifauna but are seldom visible from land. Some breed on remote islands and some along rocky coastlines. The breeding grounds of one outlier, the Marbled Murrelet, weren’t discovered until 1974, when a tree climber discovered a chick high in a California redwood. 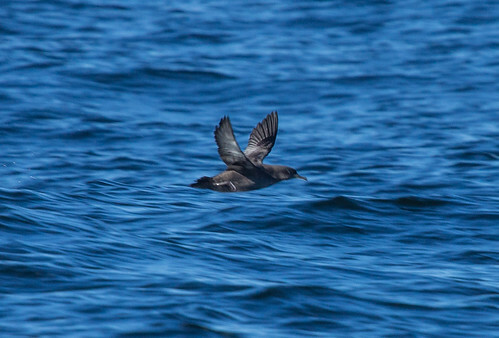 I went on an Atlantic pelagic trip in January during the Florida Space Coast Birding Festival, and saw nesting seabirds on Machias Seal Island off the coast of Maine in June, but wanted to see Pacific seabirds as well, and decided Debi Shearwater’s pelagic birding trips were the way to go. Thanks to a generous gift from my friend Susan Eaton, whose backyard gave me my year’s Eurasian Tree Sparrows, I booked seats on two Shearwater Adventures, one into Monterey Bay and one out of Half Moon Bay, for September 6 and 9. Debi Shearwater is widely known for being the inspiration for Angelica Huston’s character, “Annie Auklet,” in the movie The Big Year.” The real Debi Shearwater is blonde and pretty, but like Annie Auklet, is known for being a taskmaster. Like the best junior high teachers—the ones all the parents hope their kids will get—she knows what birders need to do to get the most out of her trips, makes her expectations very clear, and immediately takes you to task for breaking a rule. She reminded me of a world-weary teacher, still very much loving her job and doing her level best to make sure everyone on her boat sees as many birds as possible, but knowing through hard experience that people are going to ignore her rules, sometimes with awful results. Both of the trips I went on boarded at exactly 7 a.m., and were all-day adventures. 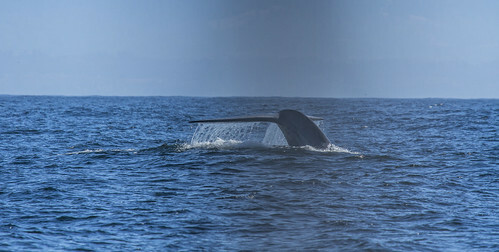 Skies were clear on the Monterey Bay trip, only fogging up as we returned to shore in mid-afternoon. It was foggy and still all day on the Half Moon trip. In fog or when seas are choppy, binoculars and cameras get covered with droplets of salt water. I kept a plastic rain guard on my camera all day. I always keep my lens hood on—it sticks out, making the camera four inches longer, but that protects the lens filter from dust, and in this case from spray and foggy droplets. I still had to spend a lot of time wiping spray from my eyeglasses and my binoculars, though those only got wet when I forgot to keep the rain guard on the eye pieces. Knowing what to expect, thanks in part to having been on a couple of Atlantic pelagics and partly thanks to Debi’s excellent rules, I didn’t miss a single bird on her trip, which helped my year list grow significantly. As Forrest Gump didn’t quite say, birding is like a box of chocolates. You never know what you’re going to get, but it’s sure to be sweet. 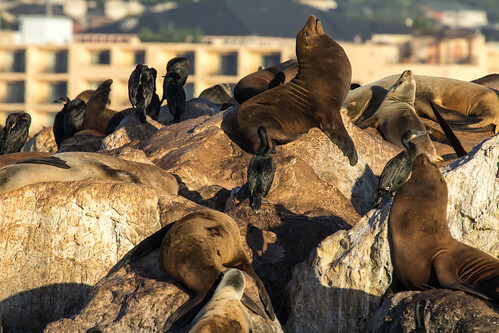 Before I set out on Debi’s Monterey Bay and Half Moon Bay trips, I was certain I was going to get at least a few lifers—birds I’d never seen in my life before—and several new birds for my Conservation Big Year list. But I had no idea what we’d see. 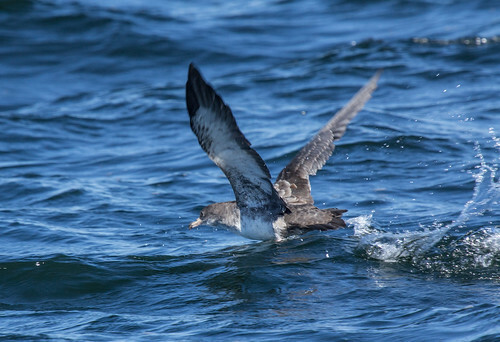 Usually the most abundant bird on Pacific pelagics is the Sooty Shearwater, which can number well into the thousands seen on a single trip, but Debi said that during the 38 years she’s been leading these adventures, on one trip they didn’t see a single one. So as with all birding, there are no guarantees. While we were still in the no-wake zone setting out into both bays, we searched the rocky jetties, picking out each of the three species of cormorants found there, along with Brown Pelicans, a few Black Turnstones, Surfbirds, and even one Wandering Tattler. These birds can be found here and there along the coast, too, so even when something fun was seen, we didn’t slow down. We were on a mission. Everyone’s mindset was on the most wondrous possibilities, so much so that one professional guide even called out a Pacific Loon that on closer view was a cormorant. That’s how it goes in pelagic birding, and no one minds, because everyone realizes that it’s better to call out a South Polar Skua that turns into a Pomarine Jaeger than to wait several seconds for a more certain identification, in which time everyone might miss their one chance at that skua. As we set out, it was fun picking through the many Western Gulls for the daintier Heermann’s Gulls. The Beach Boys famously disapproved of both species, since they wished they all could be California Gulls, but there were enough of that one, too. Seabirds can be exceptionally tiny, like the Red-necked Phalaropes we saw spinning about even in the deepest waters, or huge, like the Black-footed Albatrosses that occasionally followed the boat a ways, giving me lovely looks and photo ops of this yearned-for lifer. 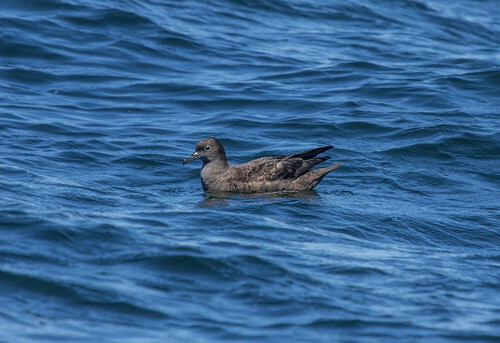 On both trips we mostly saw Sooty Shearwaters at first as we got into deeper water. This is an extremely abundant species that I’ve seen from a fishing boat off the coast of Oregon in 1979 and from a whale-watching boat from Long Beach last fall, but it was good to study this all-dark, medium-sized species, in the air and on water, so I could quickly pick out any outliers. 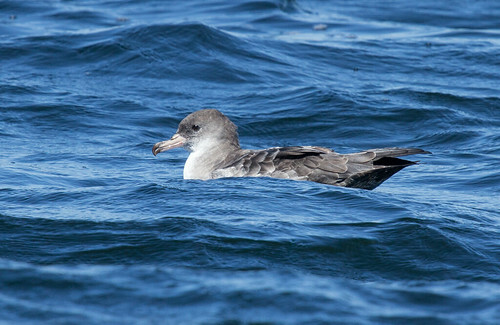 Friday we had a handful of Pink-footed Shearwaters, which are larger than Sooties and have a whitish underside. 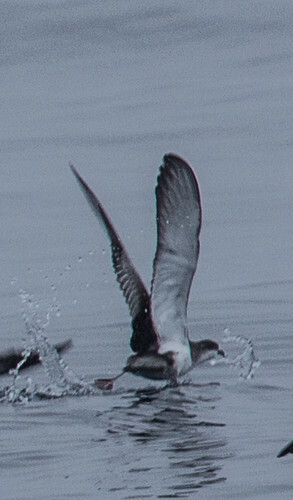 By Monday, having studied both those species well at all angles, it was much easier to pick out Buller’s Shearwaters, with their subtle but noticeable upper wing pattern and whiter underside all the way up to their throat, giving their face a bi-colored appearance. 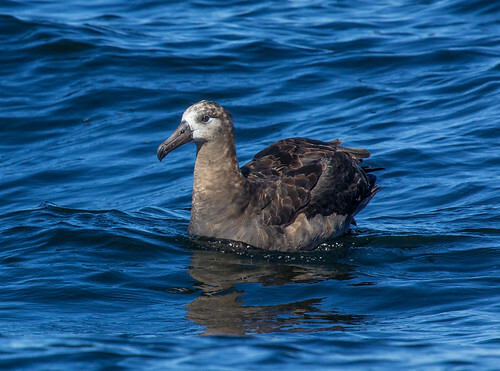 When a Flesh-footed Shearwater passed by (no photos), I forgot what to look for, but picked out the all-dark bird, huger than a Sooty Shearwater, just before it flew beyond the distance of conjecture. The one Manx Shearwater that showed up on that same Half Moon Bay trip (no photos) was equally elusive, but by keying in on the outlier, I got a quick look at this tiny guy, even spotting the tiny white crescent behind the ear feathers. I got a momentary look at a single Ashy Storm-Petrel in Monterey Bay, but leisurely looks at thousands of them on the Half Moon Bay trip. 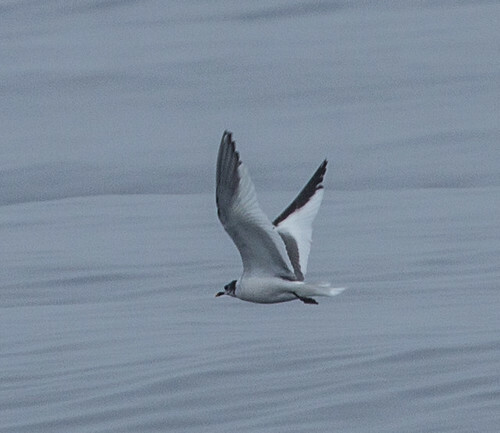 Again, taking time to study them is how I picked out the outliers—the noticeably larger Black Storm-Petrel, the white-rumped Wilson’s Storm-Petrel, and the soft gray Fork-tailed Storm-Petrel. During lulls in activity, there were always one or two birds in view, and I tried to stay focused on them. Even though I’m inexperienced at seabirds, this focus allowed me to pick out new things more easily. There were quite a few Common Murres out in the water throughout much of both trips. 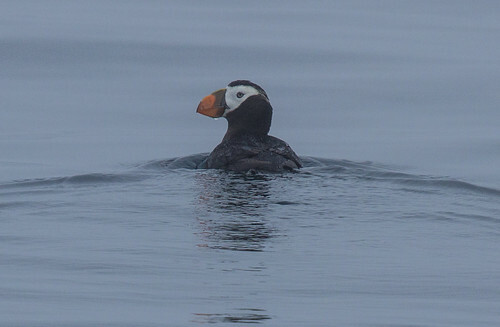 I checked out every one of them, making it easier to pick out the Rhinoceros Auklets on both trips, and a Cassin’s Auklet, a Pigeon Guillemot, several Scripp’s Murrelets, and a few Tufted Puffins. 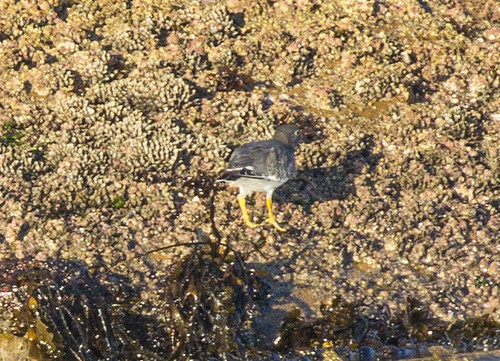 Pomarine Jaegers were seen on both trips, one Long-tailed Jaeger raced by the boat on the Monterey trip, and two South Polar Skuas appeared and lingered for a few seconds on the Half Moon Bay trip. And I finally got my lifer Sabine’s Gull–a bird that turns up virtually every year in Duluth, but that had been my nemesis bird for lo these many decades. 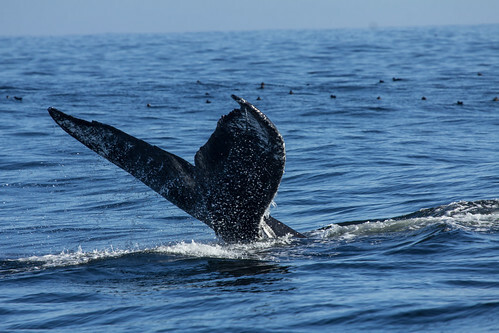 We didn’t see a single whale on the Half Moon Bay trip, but did have a couple of Humpback Whales and several Blue Whales on the Monterey Bay trip. Debi Shearwater said that the number of birds and species composition changes dramatically from season to season, and often from week to week or day to day, so she can’t say one destination is better than another. Pelagic trips are fairly expensive, because the expenses of chartering boats are so high, but boy oh boy—I had two of the funnest days of my life on these, and sure hope I can get out on Debi’s boats again some day. This entry was posted in Uncategorized on September 11, 2013 by Laura Erickson.